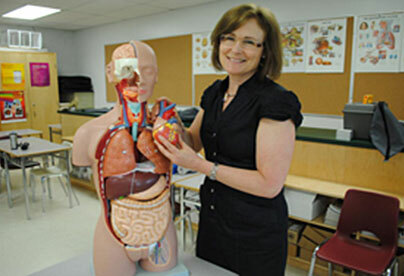 Taylor, a health sciences teacher at Our Lady of Mount Carmel Secondary School in Mississauga, Ontario, has started a CPR campaign empowering her Grade 12 students. She teaches her students CPR and how to use a defibrillator. After their instruction, they go from classroom to classroom demonstrating the basics of CPR and how to use a defibrillator. As a former ICU nurse, Taylor personally knows the importance of early CPR and use of a defibrillator to save lives. Her campaign to empower students has already shown results. Soon after Taylor’s class completed the CPR demonstrations, one of her students came in with news that she had saved a life using CPR while she was at work. “She recognized the signs, so she stepped in and took action,” recounts Taylor. The student did CPR until the paramedics arrived and then thanked them for saving the man’s life. The paramedics turned to her and said, ‘No, you saved his life.’ I got goose bumps when she told me the story, I was almost in tears,” she says. The real life application of these skills and the reach of the program is exponential, “The students will go out and share CPR with their families. A student can go home and talk to a family member, who talks to someone else, who may go to work and say, ‘maybe we should do CPR, and my kid says it’s easy’, ” says Taylor. “The ability to save someone’s life is a skill that is invaluable,” states Taylor. Her contribution to her community is also invaluable and the result will be more lives saved. ACT has presented Taylor with a Community Champion Award in 2011 for her continued support and passion for the program.